In Hall of Government at 700 Lavaca Street is the latest exhibit from the Austin Friends of Folk Art collection at the Travis County Archives. This exhibit features the work of Herón Martínez Mendoza, a celebrated potter from Acatlán de Osorio, Puebla, Mexico. On display are numerous pieces by Martínez, both large and small. Following in his family’s footsteps as a potter, Martinez began his work with utilitarian pieces; one of his early designs, a container to carry water that prevented the handles from breaking, was so successful that people lined up to buy them. This success moved him into making pots and planters, and over time, these became more and more creative as he changed their forms to represent animals, fish and various types of birds. As interest in his work grew and folk art stores sought to collect it, he let his burgeoning creativity loose to make different types of much more complex and sophisticated pieces. 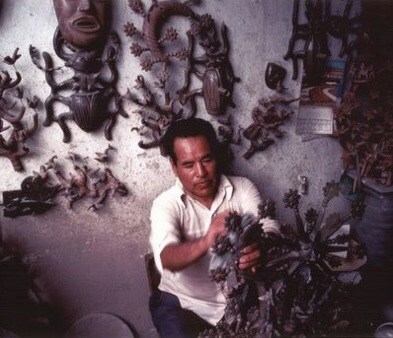 There are many collectors of Martínez’s work, that ranges from unique trees of life to whimsical zoomorphic pieces (animales fantasticos and animales grotéscos), pots, churches, masks, wall plaques and more. Martínez died in November 1990. In an interview given in the 1970s, Martínez said that he wanted his legacy to be that he had produced “a great seed for the pueblo, and he wanted the art not to perish.” His legacy survives: Mexican potters still emulate him, his work graces the pages of almost every book on Mexican folk art, museums hold exhibitions dedicated to his art, and aficionados from many countries rejoice in adding new examples of his work to their collections. Be sure to stop by to view several magnificent Martínez pieces from local Austin collectors in the Hall of Government.